Brita's advanced technologies turn ordinary tap water into healthier, great-tasting drinking water. 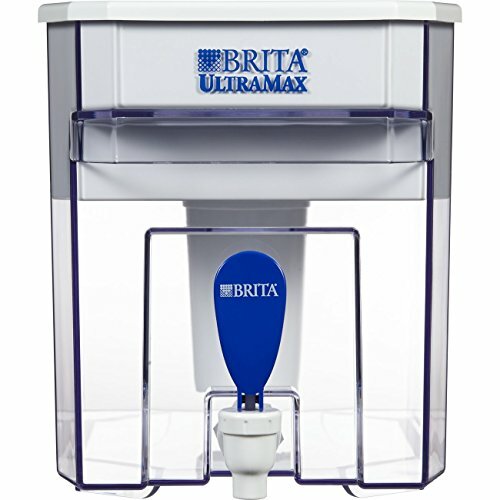 This Brita Ultramax dispenser reduces 98% of lead, benzene, mercury, copper, chlorine (taste and odor), and more from tap water. With an 18-cup (144-ounce) capacity, the Brita Ultramax works well for busy families, sports teams, and offices. To get started, just pop the filter cylinder (one included) into the plastic water reservoir, fill with cold tap water, wait for the water to filter to the lower chamber, and enjoy healthy water. The filter replacement indicator relays when it's time to replace the filter. The dispenser measures 14 inches tall by 9 inches wide by 7-2/3 inches deep. The dispenser should be washed by hand and carries a 10-year limited warranty. Certified to reduce copper.Offers a sticker filter indicator. Substances reduced may not be in all users' water. Large capacity dispenser is ideal for families - fits right on the counter or refrigerator shelf.